Scuba Diving at Hanauma Bay Nature Preserve. This amazing shore dive lets you the protected water of Hanauma Bay. We have options for both certified and first timers. Price includes park entrance fees and a tram ride to the beach. Your trip will start by meeting us at the front entrance of Hanauma Bay. There's no need to purchase tickets as we can skip the line and the ticket is included in the cost of your tour. After checking in with your scuba diving instructor you will get sized into diving equipment and ride the tram to the beach. 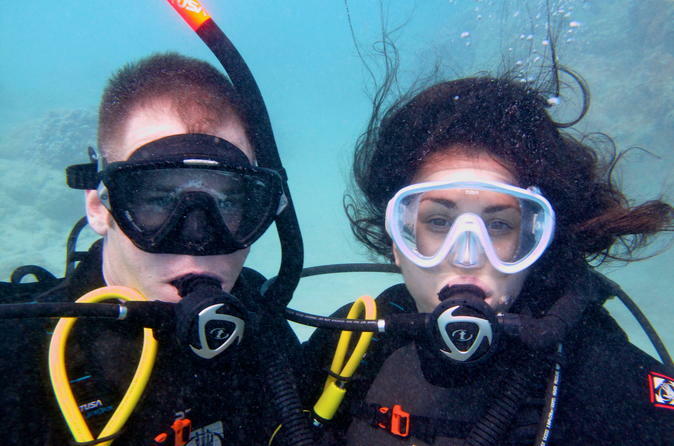 For first timers who are not certified divers you will be getting a lesson prior to getting into your equipment. Once in your gear and in shallow water there will be a skills practice session. Next we will head out into deeper waters for a beautiful underwater tour of Hanauma Bay. Generally we are in the water for approximately one hour of the excursion. After exploring the beautiful reefs and marine life of Hanauma Bay you will head back out of the park, get out of your scuba diving equipment, sign log books if you wish and finish up. Your trip includes park entrance and tram rides for the entire day so feel free to stay at Hanauma Bay for as long as you like!